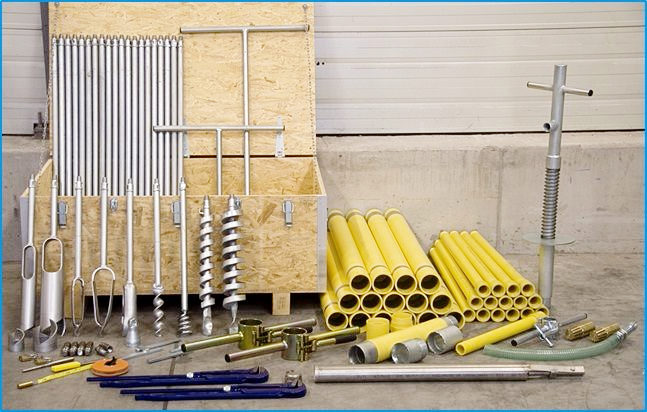 Kit for hand drilling trial boreholes for ground exploration (to 26m in soft formations) and to measure hydraulic conductivity (to 15m). Undertaking simple ground surveys can be cost and labour saving for a programme by avoiding well digging or rotary drilling in unsuitable areas. This equipment is used to assess near-surface ground conditions. The variety of auger bits will enable the user to penetrate and take sample from the layers that are encountered. 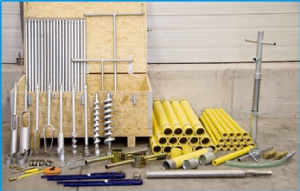 The 'jolly jumper' equipment is included to enable measurement of hydraulic conductivity and therefore, calculate the rate of recharge and yield prior to well digging. 4 1 Each Riser clamp 1½"